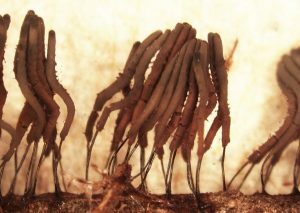 Some fungi form mycorrhizal mutualistic associations with plants, such as Pisolithus arenarius fungi and slash pines, where the fungi help the tree access nutrients in exchange for carbohydrates. Photo by Edward L. Barnard, Florida Department of Agriculture and Consumer Services, Bugwood.org. 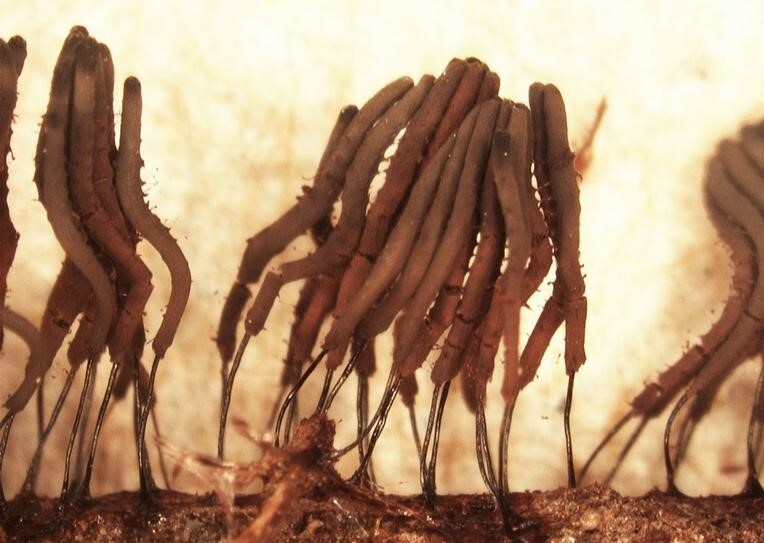 Many types of microorganisms compose the soil food web, such as this slime mold, helping to break down organic matter and make nutrients plant available. Photo by Sandra Jensen, Cornell University, Bugwood.org. Farmers are intrinsically tied to the soil that encompasses their farmland. Where others only see dirt, greenery, and maybe a few worms, farmers – especially those who rely on organic nutrient sources such as compost, green manure, and plant and animal meals to fertilize their crops – see much more. Microscopic one-celled organisms that, while small, are very prolific. An acre of productive soil has a mass of bacteria the size of two cows! Soil bacteria fall into four functional groups: mutualists (such as nitrogen-fixing bacteria), pathogens (such as bacteria that form plant galls), lithotrophs (use inorganic substances for energy), and the most abundant, decomposers. Decomposers convert the energy from plant litter into forms that are useful for the rest of the soil food web. They are very important for nutrient retention, and can prevent the loss of nutrients from plant rooting zones. Arbuscular mycorrhizal fungi colonization can assist many agronomic crops with disease resistance, such as combating the pictured Verticillium wilt disease in cotton. Photo by Clemson University – USDA Cooperative Extension Slide Series, Bugwood.org. Like soil bacteria, most soil fungi are important decomposers within the soil food web. Fungi are microscopic organisms that grow as long hyphae (thread like elements) between soil particles and plant roots. 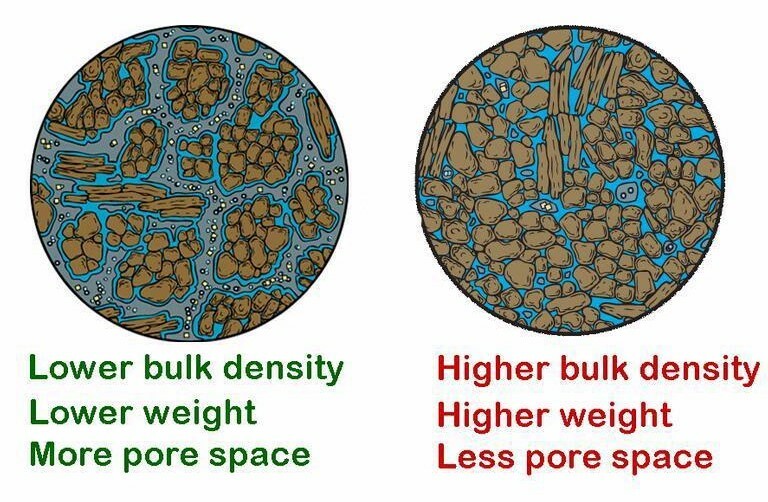 As they convert organic material into useable forms, they also create stable soil aggregates by physically binding soil particles, which helps soil hold water and at the same time increases water infiltration. Besides decomposers, there are also mutualistic fungi that colonize plant roots, exchanging solubilized phosphorus and other soil nutrients for plant carbon. 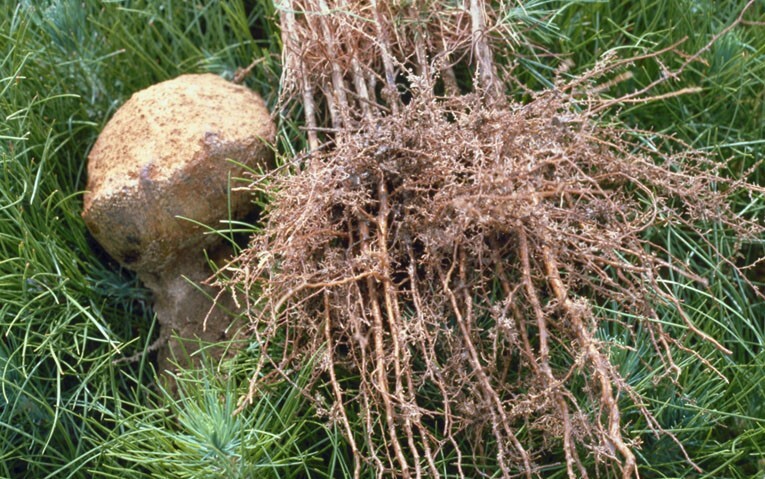 It’s the third group, the root pathogenic fungi, such as genera Verticillium or Rhizoctonia that often get the most attention, as they can cause major agronomic crop loss. Single-celled animals that are most active in the plant root rhizosphere and feed mostly on bacteria, but also on other protozoa, fungi, and solubilized organic matter. Although protozoa are five to 500 times bigger in size than bacteria, they have a lower concentration of nitrogen in their cells than bacteria. Therefore, when they consume bacteria, they release superfluous nitrogen into the soil. This nitrogen is released as ammonium, which becomes available for plants and other organisms in the soil food web. 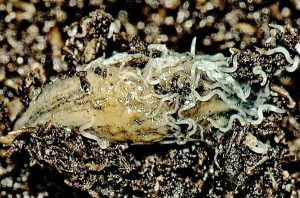 Some nematodes are beneficial, such as the slug-parasitic bacterial feeding nematode (Phasmarhabditis hermaphrodita), which serve as a biological control agent against slugs. Photo by Bonsak Hammeraas, NIBIO – The Norwegian Institute of Bioeconomy Research, Bugwood.org. Nematodes are non-segmented worms, ranging in size from microscopic to a few parasitic species that are over three feet in length! 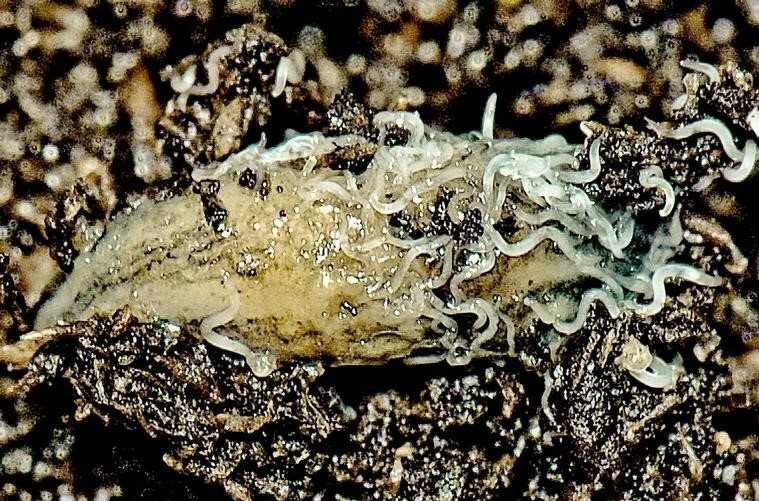 Although root feeding plant-parasitic nematodes can cause significant agronomic crop damage, most nematodes are free-living and feed on bacteria, fungi, protozoa, or other nematodes. Bacterial and fungal-feeding nematodes are especially good at cycling nutrients. When they eat, they release excess ammonium, which is available to plants. Nematodes also help disperse microbe populations, are a food source for other organisms in the soil food web, and some can suppress soil diseases. Practices such as the use of cover crops, compost, and conservation tillage can help support beneficial organisms in the soil, store carbon, and prevent the degradation of soil by the effects of erosion, compaction, acidification, and nutrient degradation. A healthy soil ecosystem not only helps cycle and retain crop nutrients, but for every one percent increase in soil organic matter in an acre of topsoil, an estimated 27,000 gallons of additional water can be retained. A healthy soil ecosystem can improve soil structure, helping to create soil aggregates, which improves aeration and water and nutrient holding capacity. 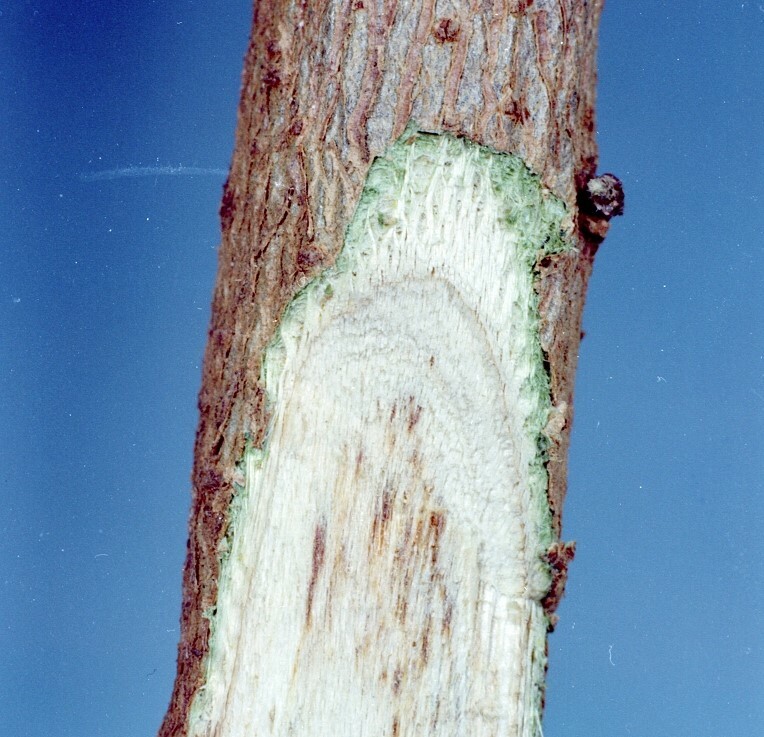 Diagram by the International Society of Arboriculture, Bugwood.org. For more information on soil biology check out the NRCS Soil Biology Primer.